Baylor School of Education graduate Dr. Michael McFarland (EdD ’05) superintendent of Lancaster ISD, is the Texas Superintendent of the Year, chosen by the Texas Association of School Administrators (TASA). As such, he will be honored by the American Association of School Administrators (AASA) at the annual convention later this month in San Diego. McFarland was named Texas Region 10 Superintendent of the Year before being selected for the statewide honor. McFarland earned a BBA in business education and information systems from Baylor in 1993 and an EdD in Educational Administration in 2005 from the Baylor School of Education. He also earned a master’s degree and superintendent’s certificate from Stephen F. Austin University. As a Baylor undergraduate, McFarland was a strong safety on the Baylor football team, playing for Coach Grant Teaff’s last team; he was team captain in 1991 and 1992. The Baylor EdD program offered a solid grounding in all aspects of the education field, McFarland said. “It was really intense, really challenging, but structured around our work schedule because the students were actually practitioners,” he said. 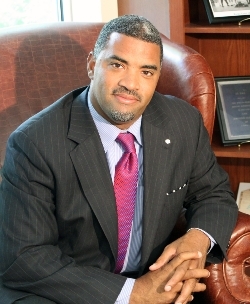 During most of his time in the program, McFarland was principal of Tyler ISD’s John Tyler High School. McFarland also said the cohort model of the program had significant benefits. “It brought a wide range of perspectives to the room, with a person in higher education, maybe somebody from an elementary school or high school and someone in a district office,” he said. With intensive summer programs, including interactions with lawmakers who were crafting education legislation, the EdD program brought the education field “alive,” McFarland said. “Others I know who attended a more traditional program or an online program don’t have the relationships with professors and colleagues that I found at Baylor,” he said. In particular, McFarland has enhanced the STEM program in Lancaster, implementing a new curriculum strategy and providing new training for secondary math and science teachers. “We have focused on increasing the rigor in all courses through the development of teacher capacity and improving the relevance of our curriculum by implementing problem-based learning activities focused on real-world issues,” McFarland said. McFarland began his career in education as an algebra and accounting teacher in Tyler and later served as principal of John Tyler High School in Tyler and Foster Middle School in Longview. He was an assistant superintendent in Champaign, Ill., immediately before coming to Lancaster.